Persimmon is a rare fruit tree in Kenya only known to a few; ironically its popularity worldwide closely ranks next to avocadoes. Nutritionally the persimmon fruit is a good source of minerals, vitamins and antioxidants important for optimum health. The trees can grow to a height of 20 feet and takes 3-5 years to start fruiting. Grafted varieties may take 2-3 years to fruit. Same as pomegranate, persimmon fruit trees are either single-stemmed or multi-trunked. Persimmons are classified into 2 major groups as either astringent or non-astringent. The astringent variety loses astringency as the fruit ripens. The persimmon fruit tree is a hardy plant that is highly adaptable to different climatic conditions with minimal care and intervention. They grow and produce well in both subtropical and temperate areas but prefer slightly warmer areas. Most persimmon cultivars have no chilling requirement like most deciduous fruit trees do. Persimmons prefer deep, fertile and well drained soils with a PH of between 6.0-6.5. All in all they grow well in a wide range of soil and can tolerate heavy clay soil with good drainage. Therefore persimmon can grow well in most parts of the country and farmers should try it out by first planting a few seedlings to gauge how the plants will perform in different localities. Seedlings used for propagation is grown from seed that can later be grafted. Trees are planted at a spacing of between 4m-6m depending on cultivar and land size. For better fruit production, Plant persimmons in areas with plenty of sunlight. Persimmons are fragile, therefore avoid windy areas or plant windbreakers. Even though persimmons are hardy regular irrigation is recommended during initial stages and during fruit set. Persimmons are heavy producers therefore fruit thinning is essential to ensure good quality and size. Training and pruning maintains well-balanced plant vegetation that eventually leads to quality production. It is advisable to prune persimmons when they are dormant. Soil and leaf analysis will always give insights on the fertilization regime to be applied. Generally farm yard manure and foliar sprays are sufficient. Persimmons are generally free from most pest and diseases but as a general rule prevention is better than cure. Plant and crop protection is important to guard against any pests or bacteria and fungi disease attacks. Some of the common pests include; fruit flies, mealy bugs and fruit spotting bug. The few important diseases are leaf spot, mildew, wood decay, blights and crown gull. There is no much literature on control strategies for pests and diseases on persimmon kaki. Generally orchard hygiene is crucial and ensure to source disease free seedlings. Spray copper fungicide, horticultural oil or neem oil as a preventative measure before any attacks occur. Our main objective is to promote fruit cultivation either for subsistence or commercial purposes our main target being small scale farmers. We collaborate with enlighten gardeners and farmers who have a passion for homegrown produce and can go an extra mile to try something new. There are several fruit trees like the persimmons that are grown in Kenya but there is no documentation on best practices and how the fruits perform in different parts of the country. We believe it’s up to us as farmers to try and experiment with the different varieties to gauge their performance in different parts of the Country. We have a catalogue of around 20 different fruit types that we do stock from time to time and have been planted in different parts of the country to monitor how they perform. Feel free to reach us on admin@plantafruit.org or call +254715963005. Fruitful 2019! Fig fruit is one of the ancient fruits known to mankind, mostly grown in tropical and subtropical areas of the world especially in the Mediterranean. It is a nutritious fruit that is richer in iron and copper contents than other fruits. Figs contain high sugar and low acid, and also rich in carbohydrates, vitamin A and C. Fig consumption and commercial cultivation has not taken root in Kenya, only few farmers and home gardeners have embraced this crop and in most cases only a few fig trees have been planted. Kamiti prisons have played a major role in the propagation of fig fruit seedlings and they are among the few fruit tree nurseries that do figs. In the marketplace figs can be spotted at Village market, a few traders deal with them at Gigiri and they don’t come cheap. We are in the process of partnering with a farmer in the outskirts of Nairobi to set up a demo farm of around 100 plants targeting a specific market giving room for expansion and full commercialization if the market responds well. Figs are low maintenance fruit crops that need less care and can grow in most parts of the country. Fig trees do well in a wide range of soil type the important factor being soil drainage. Avoid areas that have poor drainage for this may lead to nematode infestation, stunted growth and eventual demise of the plant. Generally they should be planted in well-drained soil with plenty of organic matter that will enable them grow into drought tolerant crops once the plant has developed. Soil PH of about 6.0-7.0 is desired. Farmers from arid and semi-arid areas should try out figs; they are among the fruit trees that can thrive in these areas. For maximum fruit production, Plant fig trees in areas where they will get plenty of sunlight and free from competing trees. Good water management, including regular irrigation during initial stages and mulching helps maintain tree health. Fig plants can be trained to tree or shrub form, it all depends with the farmers needs and which form does well in a given area. If figs are planted in the ground, fertilization is less necessary and should only be done after doing a soil test. Compost manure is sufficient to create an enabling environment for the fig plants to thrive. In case there is need to use fertilizers, it should not be applied at planting time. Generally, figs do not require regular fertilizing; excessive fertilizer application can have negative effects on fruit quality. All in all, sufficient nutrients must be supplied to ensure the tree is healthy. Leaf analysis and soil test will come in handy when tailoring fertilizer needs. With good preventative maintenance figs can be relatively pest and disease-free. Most common pests include; nematodes, mealy bugs, fig beetles, borers and scales. The most important disease is the fig rust, which is a fungus disease that attacks the leaves and anthracnose. This can be controlled by spraying copper fungicides from time to time as a preventative measure. Another important disease is fig mosaic virus, so far there is no cure, and affected plants should be removed so that the virus does not spread. Infected plants should not be used for propagation. Source disease free seedlings for planting and maintain proper sanitation during the lifetime of the fig plant to prevent any disease or pest attacks. Orchard hygiene is important and prevention is better than cure, prune to remove all weak, diseased or dead limbs each dormant season. Figs take 3-4 years to start producing a viable crop. Sufficient irrigation will increase fruit size and production. Fruit thinning will also increase fruit size. Figs can bear two crops a year, the first crop produces substantially compared to the second crop. Figs are Picked from the tree as they ripen, ripe fruits do not exude a milky sap when picked. One should be careful not to get in contact with the milky latex which can cause slight skin irritation. Fig fruits are normally eaten fresh but they may be dried. So far we have seen two varieties doing well in Kenya, we don’t know their names but they can be differentiated by the fruit color. There is a variety that produces yellow figs when ripe and one that produces dark purple-brown figs. For those willing to plant a few fig plants can contact us and make an order. Figs are among the underutilized fruits in Kenya. At this moment we are not sure if it is commercially viable unless one has a special market. The fact that a fruit commands a high market price doesn’t guarantee commercial viability. Fruits like kiwi, litchi, pomegranate, raspberry, blue berry, goose berry and fig are retailing at more than 1000/= a kilo but the market is limited. Not many Kenyans are aware of the mentioned fruits, we are optimistic that as the masses get informed they will embrace some of these under-utilized fruits. It takes time and expertise to build an industry around a certain fruit crop especially if it is not a mainstream fruit crop. For starters plant a few fig plants for own consumption and sell or donate surplus. Fruitful season! Pomegranate cultivation dates back in time, it is among ancient fruits mentioned in holy books. The plants are long lived, same as grapes, and can bear fruit for many years. Pomegranate is also referred to as the “seeded apple” or “apple of grain” in reference to the many seeds in the fruit. Scientifically classified as belonging to the family punicaceae and referred to as punica granatum. There are different varieties of pomegranate cultivated world over especially in the tropics and sub-tropics. It is a drought enduring plant that can sustain with small amounts of water but during tree establishment supplemental irrigation is necessary. The plant flowers almost throughout the year and the fruit has good keeping quality due to its thick rind. It can be grown into a shrub or single stemmed tree, the latter is mostly embraced. It grows to a height of 10-12 feet and bears fruit containing multiple juicy seeds. There is no serious commercial production of pomegranate in Kenya due to the fact that there is a wide range of preferred alternative fruits. The other challenge is the objective difficulty of eating pomegranate; edible grains have to be separated from the hard cover and from the bitter yellow diaphragms. It is majorly grown as a backyard crop but there are a few farmers who have started to cultivate pomegranate for the local market. There is rising demand internationally, locally the demand does not guarantee a business case unless one is cultivating the fruit for a special and personal market. But as Kenyans get informed of the fruit’s medicinal value, demand will rise gradually as Kenyans embrace this wonderful fruit. The Asian community has played a major role in popularizing this fruit by planting a few pomegranate trees in their homesteads and they are the first target market for fruit sellers. Most of the pomegranate found in supermarkets is imported. We encourage farmers to plant for own consumption and sell or donate surplus. Pomegranate can tolerate a wide range of soil types and is a salt-hardy fruit tree that thrives well on comparatively poor soils. They prefer well drained soil; deep black soil with its high moisture holding capacity and poor drainage is not recommended for it encourages only vegetative growth rather than fruiting. The plant has a versatile adaptability to a wide range of climatic conditions too but grows well in hot areas. Pomegranate trees require hot and a dry climate during the period of fruit development in order for good ripening and developing of fruit to its optimal size. It can thrive under desert conditions but bears well under irrigation. Site selection should take into consideration sun exposure and air circulation. For optimal growth and production, pomegranate requires six hours of direct sunlight in a day. The trees should be pruned and trained to grow as an open vase, in such a way that light penetrates the trees from between the rows as well as from the inside of the trees. As with all other fruit trees, crop protection is important if one is to realize quality yields. Most important diseases of pomegranate include; crown rot, bacterial blight among others. Common pests include aphids, mealy bugs, false codling moth, scales, thrips, root-knot nematode and whiteflies among others. In areas of high temperatures the fruits should be bagged as a protection measure against sun burn. Some of the physiological disorders are; fruit cracking, sun scald, sun burn and internal breakdown. Our advice as usual is to implement an integrated pest management programme and only use chemical as a last resort. Prevention is better than cure; spray your trees at least 3 times a year as a preventative measure. Pomegranate is propagated from cuttings; plants should not be established from seeds if a true to type variety is desired. Plant produced from a cutting will be identical with the parent plant. Get your seedlings from certified nurseries or from farmers who are knowledgeable in pomegranate cultivation. The government, through Karlo, Thika imported several plants which are still on trial at the institute. This crop needs early adopters and skeptical followers especially in arid and semi-arid areas where the right variety of pomegranate can be grown for export. This is a drought hardy crop that is capable of providing income security along with nutritional and food security. County governments from these areas can try out this crop and support the locals to adopt it as they come up with strategies of how to add value and market their produce internationally. Pomegranates are self-fruitful and will start to fruit in 3-5 yrs time. The fruit can ripen on or off the tree. Harvest maturity is mostly determined by the colour development of the fruit. Thinning is important if one to get a good sized fruit. The general rule is to leave one fruit per cluster; fruits that touch each other create an ideal environment for pests and diseases to thrive. Remove fruits which are deformed, damaged or borne on weak spurs. Fruit size and appearance matters when it comes to marketing the fruit. Early thinning of fruits, probably 4 weeks after flowering is useful. Perfectly ripe fruits are picked in installments, since all are not ready at once. Farmers and home gardeners should try out this fruit for both its beauty and fruit. Feel free to drop us a call or mail in case of any inquiries admin@plantafruit.org |0715963005..
Citrus is a common fruit in Kenya and is ranked amongst the most consumed fruits. Citrus is a general name for different varieties of oranges, lime and lemon. The demand of citrus is so high; local production cannot meet demand leading to the importation of large quantities of citrus fruit. The different varieties that are cultivated in Kenya include; Washington navel, Valencia, kara mandarin, tangerine, citron, Lisbon lemon, bear lemon and pixie. Major production areas in Kenya are at the coast, eastern and rift valley provinces. There is great potential in Nyanza and north eastern, the few farmers who are trying to cultivate citrus are hitting it right. Citrus is grown successfully in tropical as well as subtropical climates. Citrus can be grown in a wide range of soil and climatic conditions. Ideal temperatures range from 20 to 34 degrees Celsius. In areas that experience high temperatures, there is a risk of flowers dropping prematurely. Citrus grows well in deep soils of medium texture, with good drainage and high fertility. Well-rotted farmyard manure or composed can be used to improve soil organic matter. Soil PH of 5 – 7 is ideal. Citrus tree are capable of withstanding long periods of drought, nevertheless irrigation is important especially in the initial stages and during and after flowering to ensure sufficient water for fruit set and growth. Proper site selection is key to successful citrus growing; ensure the selected site meets the soil and climatic conditions. Choose a warm location that receives plenty of sunlight most preferably on an elevated or rolling land. Citrus prefer an open place where they receive at least 4 hours of full sun in a day during the growing season. A tree spacing of around 7m by 7m is preferable for proper aeration and sunlight penetration. Select the desirable variety that you want to plant, remember to acquire certified disease free seedlings. When planting, dig a hole then add the top soil mixed with compost, place the seedling in the hole and cover the hole with the remainder of the top soil mixed with compost. Water the plant well and build an earth wall around the seedling using mulch. Grafted citrus seedlings take 2-3 years to start fruiting, and a single tree can produce up to 200-300 fruits per season by year 5. Prune the tree as it grows to achieve desirable shape and size. As a general rule; maintain a single stem and choose 3-4 main branches to form the framework of the tree. A citrus orchard needs regular monitoring and implementation of preventative measures to deter disease/pest attack. Major diseases include; anthracnose, leaf spot, greening disease, damping off, canker and scab. Major pests include; fruit flies, thrips, citrus whitefly, mites, aphids, ants, black flies and false coddling moth. For preventative purposes, any certified copper fungicide can be sprayed at least once a month. Identify any attacks early and seek advice from your local extension officer or agro vet. Reach us @ admin@plantafruit.org for any inquiries. To a fruitful 2018. Our flagship ‘education for sustainable development project’ at Kariobangi North primary in Nairobi was kick-started in 2012; 4 years down the line we have seen tremendous results. In between the years, great work has been done thanks to the more than 1000 people that took part in the project. There are those who contributed financially and those who offered their time to work in the project. We can’t mention everyone but we have shared photos of a good number of persons who took part. Our gratitude goes to the staff and leadership of Kariobangi north primary for their support despite the many challenges. Many thanks go to Eco Schools who saw the potential of the project and offered to boost and push it to another level. The children of kariobangi north now have the opportunity to see first-hand best horticultural farming activities being implemented in their school. Those with a passion for farming will have a platform to transform that passion into an enterprise or career. The school’s food forest has different fruit trees that include: apples, grape, sapote, loquat, breadfruit, mangoes, pears, guava, peach, Jabotica, brazillian cherry among others. The school has also planted sweet potato, banana and vegetables which they sell to the local community. This project offers a great learning experience, there is so much practical knowledge on different fruit types one can acquire when she/he visits the project. This project plays an important role of connecting students with nature at an early age converting them into better stewards of our environment. We need to resurrect the tree planting culture that was emphasized by our former president His excellency Daniel Toroitich Arap Moi, and we believe the best way to do that is to target school going children. Of great importance is the acquisition of food growing/production skills that will go a long way in helping the students later in life. Students gain hands on experience in a hands off environment where they are allowed to experiment and make their own decisions. Students acquire practical knowledge in areas like; Composting, group dynamics, food safety, how to market their produce, pest management, fertilization, seed propagation, record keeping among others. The project also offers great benefit to the entire surrounding community who are free to visit the school orchard and learn one or two things from the different fruit species. Soon they will be able to purchase seedlings from the school’s tree nursery. Students taking notes at their food forest. As an organization, we have no share in the projects we implement; anything we plant belongs to the school and all proceeds thereafter are reverted back to the project. Our purpose is to ensure the fruit trees planted are well taken care of and to develop a training and business model that will generate income and make the project sustainable. We take a maximum of 3 years in a school project and then we hand it over to the school after we have trained project beneficiaries to take part in the day to day running of the project. There after we only act as consultants in areas of: seedling production, crop protection, production planning, spray techniques & Schedule, irrigation & fertilization, adult learning, market strategy and sustainable farming. Members of the community visiting the school project. We are seeking partnerships to ensure such a project is replicated in at least 2 schools in each county to enable students to plant, manage and harvest their own produce as they learn important life skills. Developing an orchard as a learning resource creates an opportunity for the students to be aware of environmental issues and come up with simple solutions to address them. Food security at a local level is tremendously important, especially when crisis hits. Farming is the foundation, as humans we need energy to function and the only source of energy is food. It’s high time we support farming and conservation initiatives both at a personal and institutional level; teach your kids to grow food, support tree/food growing programs in local schools, make donations to credible organizations such as the Green Belt movement among others. We all can be part of the solution by simply planting and taking care of a single tree. And to our dear leaders who ride on any food crisis to gain economically and politically, we only have this to quote; “If you can’t feed them, you can’t lead them”- Anonymous. Plenty be found within our boarders. For the better part of the last six months we’ve been on the ground making a follow up and conducting farm visits to the farmers we have partnered with. This post will highlight what fruit crops home gardeners and farmers are embracing and the commercial viability of the different fruit types. We encourage sustainable diverse cropping systems where farmers plant more than one crop. This spreads economic risk and offers the opportunity of reducing production costs and increasing profits. The more farmers’ successfully produce more of one type of crop, the more they are whipped by low prices making them a victim of their own success. That’s the greatest irony of farming as dictated by the laws of supply and demand, hence the need for diversified farm systems. Such diversified systems require thorough planning and close monitoring to cater for the different components. 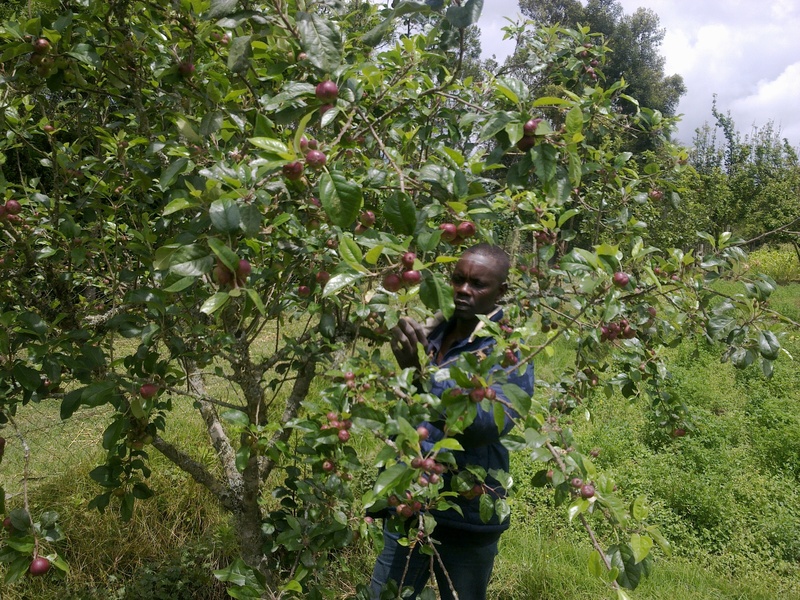 For easy management we recommend 2-3 main crops and a set of rotational crops, for example, we have a farmer initiating a mixed fruit orchard in Murang’a doing hass avocado, tree tomato and apples. A serious fruit farmer should also embrace an integrated pest management strategy and maintain the farm in ways that make them attractive to beneficial insects and pollinators such as bees, and implement interventions to protect them. No pollination, no fruit. Start with what you can manage as you progress. Farming is a journey, more of a marathon than a short sprint. It requires more resilience and focus on a desired farming venture. There those who get it right in their first attempt and there those who fail initially or severally but later on get it right because they chose not to give up. Grow that which has market potential, whether it is for home or commercial purposes. Copying what your neighbor or other farmers are doing is not a sin; but don’t just copy for the sake of copying. If you can read this post, then you are intelligent enough to do your own research before investing in a given venture. What you settle for has to be a crop that performs well in your locality and thrives in your soil. Test and analyze your soil and optimize it accordingly, the health of the soil determines the health of the plant. Failure is inevitable, the love and passion of your venture will play an important role in such times. One of our clients insisted on planting apples, grapes and other fruits at the coast just for the love of apples, she even went for high chill varieties against our advice. She failed severally, many apple seedlings she purchased from different nurseries died within the first year. But she understood that there was a price to pay to conduct her own research and know what works for her. Despite of the many failures she now has the privilege of harvesting a few apples of different varieties from her 2 year old plants after 4 years of trial and error. She is now planning to do grapes and apples commercially. Consult widely, do your own research and search yourself too. Identify fruit crop(s) that you will love cultivating, works well for you and can generate good income. Our country is blessed; plenty of different fruit trees and food crops thrive in different parts of the country. Local farmers are spoilt for choice on what to venture in. A typical Kenyan farmer faces a lot of challenges and hurdles from farm to market. The successful ones will be those who will emerge as problem solvers and solution providers despite of the many challenges; those who focus on providing practical solutions to problems experienced by the population rather than sit on a problem or write a thesis/research paper to be archived on the shelves. Globally, our country is a horticultural giant, there is a huge demand for our horticultural products that include; flowers, herbs, veges, fruits and nuts. For Kenyan farmers to meet this demand, best farming practices should be embraced to ensure quality and food safety. Locally, there is a rising demand of healthy farm produce that is free from harmful chemicals. Produce crops that comply with GAP standards from the on-set no matter the target market. Below are some of the fruit varieties that are commercially viable and worth giving a try. Avocado– The hass variety is the most preferred for those targeting the export market due to its high oil content, appearance and low perishability. There is a niche market for Fuerte and Pinkerton variety locally; there high perishability does not make them good candidates for the export market. Passion Fruit – The two common varieties are; sweet yellow and purple passion. Both varieties do well locally and there is demand for both in the local market. The export market prefers purple passion; Europe is one of the main markets. In the past few years farmers from Rift valley have shifted to passion fruit cultivation without regret and we are seeing a lot of activities in Uasin gishu, Bomet, and Kericho. Mango – There are different mango varieties that thrive in different parts of our country, but so far there is high demand for the Apple mango variety that thrives in hot areas. Other popular varieties include; Kent, Tommy and Haden. There is an emerging export market for Kenyan mangoes in China, hope this holds up. Citrus– New citrus orchards are being developed in the coast, eastern and rift valley by farmers who are targeting to meet the local demand. Most of the citrus consumed locally are imported because the local supply does not meet the demand. There is need for improving production and quality of local citrus. The different varieties cultivated are: Pixie, Minneola, Clementine tangerine, lemon, Washington navel, Valencia among others. Strawberry – So far chandler variety is the most successful varieties to cultivate. Most farmers are producing for the local market. We are trying out Quinault variety and some other giant strawberry varieties to see their viability. Tree tomato – A good number of farmers have ventured in tree tomato cultivation to meet local demand. Red oratia is the most grown variety. One can choose to cultivate grafted tree tomato or the non-grafted ones. Grapes– This is one of the fruits whose potential remains unexploited by the Kenyan farmer despite it doing well in various parts of the country. Most commercial grape ventures are established by wineries and geared towards wine production. Grape plants grown in the country are mostly grown by home gardeners for personal consumption. The local demand for table grapes and raisins heavily relies on imports. Apples– In the near future high quality locally grown apples will be at the shelves in your grocery store. New apple orchards are cropping up in different parts of the country targeting the local market. Different varieties have been tried and tested in different parts of the country and the results are promising. These varieties include; Cripps pink, Anna, Golden Dorset, Fuji, Gala, Red delicious and Braeburn. Bananas – This is the most important fruit crop in Kenya. Banana farming has been gaining momentum thanks to attractive market prices and availability of quality propagation material through tissue culture. There are different varieties that perform well in Kenya, study what the market wants and go bananas. Pears and plums– A good number of farmers in Molo, Limuru and some parts of Kiambu have cultivated pears and plums that they supply to the local market. There are low chill pear varieties that do thrive in warm areas. The hood variety is a low chill variety that has been proven to do well in Kenya. We have distributed a few seedlings to various farmers in western Kenya and Nyanza to gauge their performance. Kiwi– So far we have no success story on kiwi cultivation, we are still in the infant stages. We can’t confidently say that the kiwi plant thrives in Kenya. The oldest plant we are monitoring is almost 3 years old and we are seeing no sign of fruiting. The greatest challenge in kiwi production is the propagation material. Most kiwi seedlings in the market are propagated from seed; this takes long to fruit or might fail to produce fruit. There also other fruits which are mostly grown for personal consumption or on a smaller scale. They include Persimmon kaki, Sour sop, Pomegranate, custard apple, star fruit, lychee, guava, loquats, peach, fig fruit, rasp berry, white sapote, jack fruit, apricot and dragon fruit among others. In case of any queries feel free to reach us via mail at admin@plantafruit.org. Fruitful season ahead and remember to consume atleast one fruit a day before any meal. Avocado is among the most nourishing fruits that are largely cultivated in the tropics. In Kenya, it is one of the most consumed fruits that is readily available in the market all year round. Going by the latest HCDA statistics, avocado has a fare share among the leading export crops and Kenya stands out as a major player in the avocado export market. Locally avocado is sold at the market place from between Kshs10 to Kshs 50 depending on the size and quality. Avocado trees are very productive and are capable of fruiting all year round. At maximum production a single mature tree can produce 70 to 100 kg of fruits per year. There are avocado orchards flourishing in a wide range of environments but for optimum growth and yield, tropical regions with temperatures ranging from 25 to 30 degrees Celsius and rainfall ranging from 750mm to 1200mm is ideal. Avocado grows in a wide range of soils too, as long as the soil is well drained and the growing site doesn’t have a high water table. Heavy soils will make the trees susceptible to root rot. The selected site should be exposed to enough sunlight and protected with wind breakers if the area experiences frequent strong winds. It is recommended to plant trees in a straight line to facilitate proper husbandry measures and harvesting. Spacing depends on the cultivar; it varies from 6m by 7m to 8m by 10m. Ensure you acquire certified and true-to-type seedlings from reputable suppliers. If you are planting the hass variety, its advisable to have a few of either fuerte or linda avocado trees for the purpose of cross pollination. We largely stock the hass variety due to its high demand and a few of fuerte, pinkerton and linda. As usual, carry out soil testing and analysis to establish the nutrient requirement. This will enable you make an informed decision on the fertilization program to implement. When planting, ensure you mix the top oil with farmyard manure, phosphate and soil bio-pesticide; we highly recommend Trichoderma. During the initial growth stages, formative pruning is desirable to encourage lateral growth. Ensure all shoots originating from below the grafting joint are pruned off. Weed control and soil management are necessary to prevent competition for nutrients. Young trees should be mulched to increase water retention rate but ensure there is a gap between the mulch and tree trunk to avoid pest and disease infestation. Nowadays, rainfall patterns are highly unpredictable; ensure you have an irrigation program that will supplement rain. Orchard sanitation is the first step towards proper control of diseases and pests. We have an integrated pest management and crop protection programme targeting avocado farmers that can be utilized. That passion fruit is among the fruits that have great economic importance in Kenya cannot be gainsaid. The demand for passion in both local and export market is huge. Kenyan farmers have not fully exploited this opportunity due to various challenges that we are trying to address. For the past 6 months we have been on the ground working hand in hand with farmers in Nyahururu, Uasin gishu, kitale, and Migori to develop purple passion fruit orchards that meets the export market threshold. This article will highlight the various processes we applied to ensure effective cultivation, harvesting and marketing of passion fruits. There are 2 types of commercially grown passion fruit in Kenya; purple passion fruit and the yellow passion fruit. At the moment, we are concentrating more on the purple passion fruit due to its potential for fresh market and juice extraction both in the local and export market. Purple passion is most suited to upper midlands and highlands with an altitude of 1100m-2500m above sea level with temperatures ranging from 18-28 degree Celsius. They can be grown in a wide range of soils provided there is adequate drainage with a soil PH of between 6.0 – 6.5. The cultivation site should be exposed to enough sunlight with an annual rainfall of 900mm – 2000mm per year. Irrigation systems can be designed and developed in areas that don’t experience enough rainfall. A single plant can consume 20 litres of water per week. Passion fruit is propagated through seed, grafting and tissue culture. We raise our seedlings organically using beneficial fungi and bacteria that come from the soil to control pest and diseases from the initial stage of propagation. We solarize the soil and use Trichoderma that prevents nematodes and soil diseases and also promotes root growth and yields. Our rootstocks are raised from the bitter yellow passion variety called Zimbabwe and we graft using the purple passion scions. We do assist our clients in setting up a passion fruit seedling nursery once they have grown the plants. This comes in handy when one wants to replace diseased plants or plants that have reduced productivity. The seedlings can also be sold to other farmers offering an alternative source of income. If one is purchasing seedlings elsewhere ensure to get certified planting material from reputable seedling suppliers. The passion fruit plant should be trained to grow on trellises for optimum growth and yield. The spacing of the poles is directly related to the spacing of the passion fruit plants. The poles are to be placed between 2 or 3 passion fruit plants, spaced 3 metres a part. Intermediary poles can be introduced to prop up the wire in case of heavy fruiting. The distance between rows is usually 3 metres and the rows should be parallel to the direction of the wind. During planting one should dig 2 by 2 feet holes and mix the top soil with organic manure before planting. 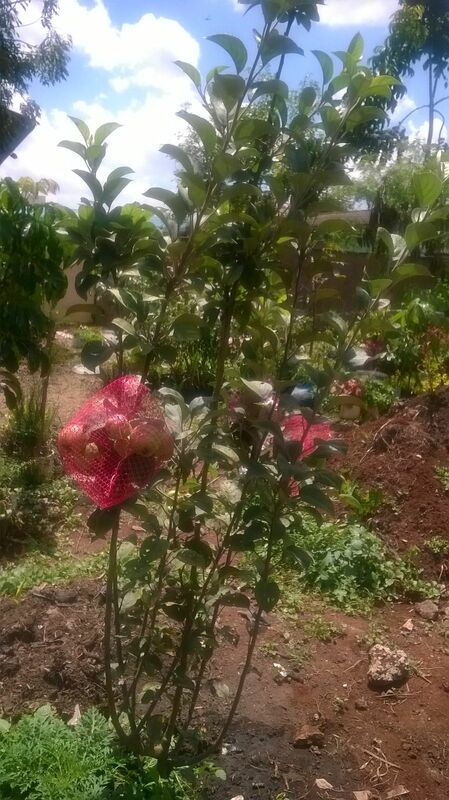 Minimum investment for one acre passion orchard ranges between Kshs 80,000 to Kshs 100,000. For optimum production, passion fruit plants need training, pruning, weeding, fertilising and crop protection. Start training the passion fruit vines at an early stage, allow 1-2 vines of each plant to run along the trellis as main vines, this allows laterals from the main vines to grow downwards bearing fruit. Prune to eliminate unwanted shoots and vines to permit systematic growth. The nutrient status of the soil will determine which fertilizer program to be embraced, for this reason a soil analysis and test is of great importance. Weed frequently to reduce competition for nutrients and unwanted pests and diseases. Ensure phytosanitary standards are highly observed, this will help reduce cases of diseases and pests that include fusarium wilt, woodiness virus complex, brown spot etc. We do have an integrated pest management strategy that we are implementing with the farmers we are working with to ensure that the fruits harvested can be accepted in different markets both locally and internationally. Peach is a temperate fruit tree that belongs to the family of rosaceae, same as the apple. Peaches have not penetrated the Kenyan market that well; the fruit is spotted in few high end market places. However there are few farmers who cultivate peaches on a small scale and do sell their produce to roadside vendors. Peaches too require a chilling effect to break dormancy. Different peach cultivars have varying chilling requirements. Ideal locations for growing peaches are altitudes of approximately 1500-2500 m.
There are two important factors to consider when growing peach; proper site selection and cultivar choice. Peaches can be grown in a wide variety of soils as long as it is well drained. Soil PH of slightly above 6 is ideal. The site should be exposed to enough sunlight with an annual rainfall of about 800-1000 m. Cultivars propagated in Kenya include; alexander, jewel, waldo, killiecrankie among others. Healthy, disease free and vigorous seedlings ought to be planted. A spacing of 5m by 6m is ideal from one tree to the other. Ensure the planting holes are large enough to accommodate the root system. Intercrops such as beans and peas can be grown in between the peach trees during the initial stages. The trees should be well maintained and pruned to the desired shape. Peaches are heavily pruned to ensure a strong tree and high quality yield. Open centre pruning technique is preferred to facilitate the penetration of light and air circulation. Peaches should be pruned annually to remove old wood because a peach tree produces fruit on one year old wood only. Nutrient levels should be maintained to keep trees healthy and productive. This is realised by applying manure and fertilizer; soil and foliage tests will determine nutrient need. Peaches start fruiting in the third or fourth year. Thinning is necessary to control the number of fruits and for the production of quality peach fruits. One would rather have 200 quality well sized fruits than having 400 poorly developed fruits. Fruit don’t ripen uniformly on the tree so it is necessary to hand-pick fruits selectively. Fruits can be stored for 1-7 weeks under refrigeration and at a constant temperature. A wide variety of pests and diseases attack peach trees, these include; aphids, moth, fruit flies, nematodes, scab, mildew, leaf curl, rust and root rot. In case of an attack do contact your extension officer for proper diagnosis and recommendations. As a general rule, prevention is better than cure; plant disease free seedlings and closely monitor your plants for any slight attacks. Happy season and ensure you plant a fruit tree. Jurgen Griesbach, (2007) Growing Temperate Fruit Trees in Kenya. World Agroforestry centre, Nairobi. Apple belongs to the family rosaceae. It is a hardy deciduous temperate fruit tree that needs low temperatures of around 13⁰C to break dormancy. There are apple cultivars with a low chilling requirement that can do well in areas that do not experience low temperatures. Alternatively dormancy can be realised through the use of chemicals or mechanically through defoliation to induce early dormancy. We can confidentially ascertain that apples can do well pretty much in most parts of Kenya, even in areas experiencing high temperatures, as long as the right cultivars are used. Fruit production might vary in different climatic conditions, but one can get a substantial harvest. Commercial apple production requires two essential preconditions: cold winters and relatively hot summers. Apples do well in areas with an annual rainfall of 800 to 1100 mm. Apples can do well in different soil types as long as the soil is deep, fertile, properly aerated and well drained. Sufficient soil moisture is desired during bud break and fruit set for proper fruit quality and yield. Most apple cultivars are not sufficiently self-pollinating; it is advisable to plant other cultivars that act as pollinators, these include winter banana, Jonathan and golden dorset. A spacing of 2-3m between plants and 3-4m from row to row is ideal. Soil and leaf analysis will offer great insights and will determine the fertilizer programme to be adapted. Apple trees should be properly cared for during formative stage to guarantee a good yield. Trees should be pruned to the desired shape. One should strike a balance between vegetative growth and fruit production. The ‘open centre tree’ is the most common pruning technique that is practised. Thinning is also desired for it helps improve fruit size and quality. There are two main picking seasons: February and August. A year round supply can be realised, picking time can be controlled by the timing of leaf stripping. Apples ripen on the tree and should be hand-picked when they have reached optimum colour and size. The major pests and diseases include; aphid, thrips, spider mites, fruit flies, apple scab, powdery mildew, armirallia root rot. Preventive control of pests and diseases is desired, use disease free seedlings and ensure to observe high standards of hygiene in your garden. As usual contact your extension officer for proper diagnosis and advice. We do provide extension services and also stock disease free seedlings. The varieties in stock include; Ana, braeburn, Fiji, gala, red delicious, golden dorset and cripps lady. Happy season and ensure you plant a fruit tree; an apple a day, keeps the doctor away. Suggestions in this site should be used as a basis of your own experimentation.